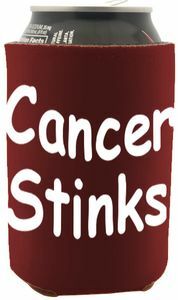 Head and Neck Cancer Stinks Can Holder: Screened on both sides with the powerful words "Cancer stinks." This insulated, collapsible Can holder is Burgundy for Head & Neck Cancer Awareness. Perfect for keeping summer drinks cool, or use indoors any time! Great gift idea for friends, family, support system, or your medical team. Be sure to include one for yourself! Please click "Read More" to pick color. Burgundy for Head & Neck Cancer Awareness.